Mototune built for Team Yamaha Norway’s Thorvald Saeby. using Nutec fuel and an Akropovic exhaust system. Dyno Produced Higher HP Readings. In 1999 we had 101.8 peak Dynojet H.P. and in 2000 we had 110.9. We didn’t do anything new to make 9.1 more horsepower, and both bikes had the same speed. The 2000 dyno just gave everyone's bike 9% higher readings. We’ve built 15 other Supersport R6’s that made anywhere from 104 to 112 peak HP on 15 different dynos around the USA. All 15 Mototune R6's would be within half a horsepower from idle to redline if tested on the same dyno at the same time. They're great for testing changes on one bike or comparing multiple bikes, if the tests are done back to back on the same dyno, on the same day, and with no changes in air density. Pat "MotoMan" McGivern, and Greg Moon. Here's a comparison of the power curves of 3 exhaust pipes on a stock engined R6. Each pipe was optomized for jetting and dyno tested back to back. The green curve is the Akropovic. Since then we've tested the Yoshimura Duplex pipe and found it to produce a clean power curve like the Akropovic. 1) Your speed all the way down the straight depends on your turn exit speed. 2) When you can out drive other riders’ just as you enter the straightaway, they lose the opportunity to draft and pass you back at the end of the straight. 3) How often have you gotten stuck behind a backmarker and lost momentum?? 4) Everyone blows a turn once in a while and gets stuck in the wrong gear. These are the realities of racing !! If you’re going for a championship, you need a bike that’s capable of winning in real race conditions. I don’t have an actual dyno sheet that compares The 114 HP R6 to The Mototune R6, so I made a graph to help explain the speed advantage we had. It’s pretty accurate as far as the peak numbers and shapes of the 2 curves. The 4 vertical lines represent the 4 key RPM zones of the Mototune race strategy. Improving on the basic power curve starts out with the right tuning. R6's are extremely sensitive to exhaust system and jetting. There's nothing an engine builder can do with the motor to compensate for the wrong exhaust system or jetting set up. the high average HP of The Mototune R6. Good News! You already own the best R6 air filter ... stock Yamaha ! Keep it clean by washing it in dishwashing detergent, never use gas or other solvents. Fuel Screws: On U.S. models you’ll have to first drill into the brass plug that blocks the pilot screw access, then use a sheet metal screw to pull out the plug. Carefully clean out all the chips, and turn the screws in until they lightly seat. Back them out 2 1/2 – 3 turns from there. Needles: use a .020 inch (.5 mm) washer to raise the stock needles. Make sure the washer is no larger than the diameter of the needle top, or it won't seat in the bottom of the slide correctly. Main Jets: Keep the stock stagger, and increase the main jet 1-3 half step sizes richer (depending on temperature, humidity and elevation) Always use stock main jets, aftermarket jets use a different calibration system. On a wet track, your bike's bottom end acceleration curve is super critical. This is the first key area I concentrate on. Whenever the arc of the power curve changes, the bike accelerates at a different rate. In wet conditions The 114 HP R6's tire will break loose easier, because it goes through 3 different rate changes during acceleration from 6,000 – 9000 RPM. The Mototune R6's linear power delivery is clearly the winner in the rain. Even in the dry this rpm range is important. Have you ever set up a guy up for a last lap inside pass, get in a little too hot and accidentally select 3rd gear instead of 2nd ??? It’s hard to recover from that on a 600, because they’re notorious for lacking balls around 7-9000 RPM. Plus, usually you have to wait until the bike settles before you can make a downshift. The natural reaction on a 600 is to pin the throttle as soon as possible to get it back in the power. The 114 HP R6 is weak in this range, so if you get stuck in too high a gear, the competition will drive right back past you !! The Low End Power’s Gotta Be Torquey, But Most Importantly Ssmmoooooth. like a roll - on drag race. At this point the rear tire can’t take any more horsepower over "maintenance throttle" or it will get sideways. As you start to straighten up the bike, more power can be rolled on, but it’s still easy to overpower the tire because there’s so much available power against a lot less traction. A hard drive with The 114 HP R6 will result in a series of small slide - hook - slides that scrub off speed. Any time the tire gets sideways the "drag race" has to wait until the rider can regain control of the power / traction equation, either by rolling off or having to delay the drive out. Since The Mototune R6's drive starts earlier, you can pull an immediate gap to break the draft. Racers and tuners that concentrate only the peak HP number aren’t considering the exit speed they’re giving up ! 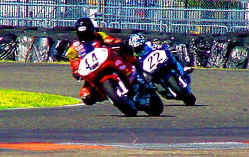 2000 AMA 600 Supersport timed practice. Rumor has it that Tommy's Factory R6 had 117 Hp !!! Regardless of their bikes' Peak HP... both riders are in the "Dry Drive Zone" of the rev range right now. 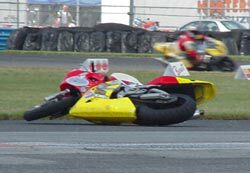 The Daytona Horseshoe turn is a popular spot for highside crashes !! Once you’ve fully exited the turn and the bike is 100% hooked up and driving, the average peak horse power comes into play. The peak horsepower number can be deceiving… especially on an R6. They have a unique power curve that actually peaks twice, at around 12,000 and then again just as it hits the rpm limiter. We found a way to fill in the big valley between The 114 HP R6's 2 power peaks. It's a combination of cam timing and friction reduction. It cost us the big peak number, but the advantage is obvious....The Mototune R6 keeps on increasing speed over The 114 HP R6 through 3rd, 4th, 5th, and 6th gears. Put it All Together for the 172 Mph Run. At Daytona The Mototune R6 smokes The 114 HP R6 through the "dry drive range" out of the chicane, enough to pull away and out of drafting range. Next it used it’s higher Average HP through the gears to reach the critical ram air speed of 130 mph at an earlier point on the banking. Then as the bike comes off NASCAR turn 4, the motor is laboring the hardest… the middle of 6th gear at 12,500 RPM. The high speeds of Daytona's banking create unbelievable centrifugal force on the tire that can increase the outer diameter by as much as 3 inches. Tire growth makes the effective gearing of your bike even "Taller"!!! At this point getting to 172 mph is all about the struggle to push through the 155 mph aerodynamic blast.... The 114 HP R6 power falls flat and it revs out slowly. It simply doesn't have enough time or steam to pull to 172 mph. The Mototune R6 is pulling hard coming off NASCAR turn 4. It's in the meat of it’s power advantage, and the higher speed built up to that point adds extra ram air horsepower for the 172 mph run to the checkered flag. The Average Peak Horsepower covers the range from the shift drop up to the rev limiter.